Over four decades of teaching this game, I’ve come to realize that the majority of golfers struggle to consistently play well because of issues with the backswing. For most, the conventional backswing is difficult to master and repeat, and when it goes bad, so goes the ability to synchronize the arms and the body during the swing—the most important factor in hitting consistent golf shots. If the synchronicity is off, the downswing becomes a rescue mission to get the clubface squarely on the ball. Top players through talent and practice can get by with compensations, but most golfers, if they aren’t in sync, really struggle. Knowing this, I set out to find a way to make the move to the top simpler, more efficient and easier to repeat, so the downswing could be largely a reactionary event. After all, the downswing happens in the blink of an eye. If you can get into a good position at the top, you’ll have a much better chance of being in a good position when the clubhead meets the ball. It took several years to conceive, study, design, refine and test—including putting it through the paces at a biomechanist’s lab—but I’m happy to say I’ve developed a new way to swing that does make the backswing simpler. And that helps improve the efficiency of the entire motion. I’m convinced this new technique will help a great many people play better golf. I call it the A Swing. The „A“ stands for „alternative,“ because it’s great for players struggling with the conventional swing. My new book, The A Swing: The Alternative Approach to Great Golf, details what makes the swing effective and how easy it is to implement. In the meantime, I wanted to give you, the Golf Digest reader, a preview of what it’s all about. I’ve had a long relationship with this magazine, and golf aficionados like you are a big reason I still find joy in teaching and coming up with better ways to play the game. Great players of the past have displayed traits of the A Swing. In fact, it’s a culmination of what I’ve learned during my entire career. It borrows from things I used to discuss with world No. 1s Nick Price and Nick Faldo, as well as current players, like Lydia Ko. It also stems from studying the motions used in other sports, such as baseball and tennis. And as I mentioned earlier, there’s real science behind it. So now that we’ve got the drumroll out of the way, let’s look at the A Swing. If you’re struggling, give it a try. You might just find your A game with the A Swing. 1. 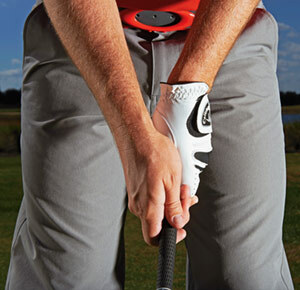 Set the handle of the club diagonally across the fingers and just into the palm of the left hand. The grip should sit against the crook of the forefinger. The first knuckle should protrude as if resting on a trigger. 2. Now put the right hand on top of the left so the lifeline in the right palm covers the left thumb. Wrap the fingers of the right hand around the grip, and let the right forefinger separate a touch from the middle finger so it also appears to be on a trigger. The thumbs should be parallel to each other and appear stacked. 3. Check the forefinger lines. The base of the left forefinger (imagine a line from the big knuckle to the first joint) should point to the right eye. The base of the right forefinger should point to the left eye. 4. Hold onto the club lightly (estimate a 3 or 4 on a scale of 1 to 10, with 10 being the tightest). Sense almost no pressure on the middle section of the grip. But feel a little squeeze with your fingers at the top and bottom. 1. Get into the address posture without a club, and rest the hands on the sides of the stomach as if giving yourself a hug. The spine should be tilted slightly away from the target. 2. 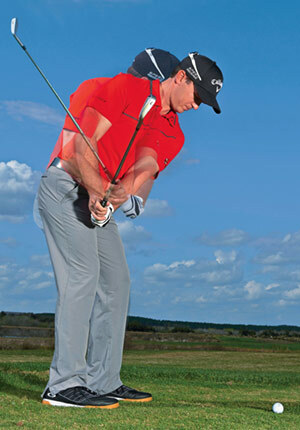 Simulate the backswing while keeping the arms folded. As the upper body winds back and you feel pressure building in the right heel, the left shoulder tilts toward the ground and the right hip rises slightly. 3. Transition into the downswing by unwinding the lower body toward the target with a slight lateral shift as you are still winding the torso away from the target. Feel the body weight move to the front part of the left foot. 4. 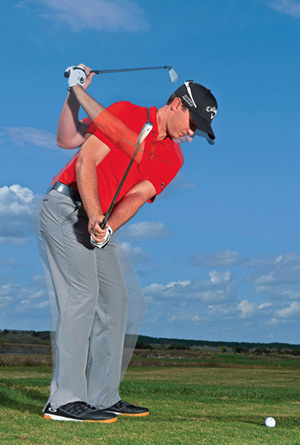 Just like in a traditional downswing, rotate the hips and torso toward the target. Feel the downward pressure in the feet moving into the left heel. Finish in balance, up on the toes of the right foot. 1. Swinging back, the left arm stays pinned to the torso and the right arm remains above it. The right wrist hinges the club up steeply. The left wrist remains cupped, and the right biceps pinch the right side of the chest. At halfway back, the shaft angle nearly matches the spine. 2. Coming down, the lower body glides toward the target—the first move down—which helps the club fall onto a shallower plane. Then the torso rotates forward and the right elbow drops toward the right hip, setting up the most solid strikes of your life. Simplify your swing with this new, tested method. The A Swing starts from a fairly standard setup. One difference is, the right foot is pulled back, creating a closed stance. A shallow downswing ensures that the club approaches from the inside, and then it’s just squaring the face to hit a draw.